represents an ideal that finds expression in our mission statement. "The mission of the BHUSD, the heart of our city's pride and excellence, is to ensure that our students are humane, thinking, productive citizens through an educational system characterized by state-of-the-art technology; a dynamic interdisciplinary curriculum; student centered active learning; respect for diversity, strong parent and community involvement, and a nurturing environment where all share a common purpose and a joy of learning." Although the school was established in 1927, our official seal was not developed until 1966. In September of 1965, Mr. Gary Mercado of Josten's jewelry company began his research into Beverly's history and tradition, and by February, 1966, the seal had been adopted by the school. We call ourselves the Normans, so the coat of arms includes a lion on an orange backdrop, representing the lion of William the Conqueror, the greatest Norman. 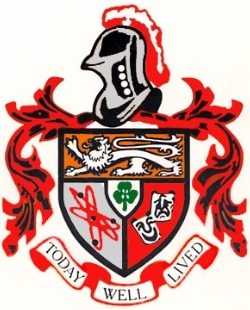 The atomic symbol, red on silver, represents science; the Greek masks of Comedy and Tragedy symbolize the arts; and the green shamrock in the center represents Mr. James L. Kennedy, who spearheaded the establishment of Beverly Hills High School in 1927. NOTE: this information was discovered by your webmaster in a very old copy of our high school paper, Highlights. The accompanying photo was in black and white, so I apologize if my renderings of the color scheme are not completely faithful to the original. I guarantee you, no one has seen this color scheme in 25 years! *The motto "Today well lived" seems to be all that is left of an inscription in the very first (1928) BHHS yearbook, The Watchtower. It is part of a Sanskrit Proverb: "Yesterday is a dream, tomorrow but a vision. But today well lived makes every yesterday a dream of happiness, and every tomorrow a vision of hope. Look well, therefore to this day."